THE search has begun for Down district’s brightest education stars. Teachers, pupils, parents and local people are called upon to nominate their Primary school for recognition at Down District Council’s Chairman’s Awards 2013. This year the Awards seek to recognise the achievements of our children and the people in our Primary Schools who dedicate their lives to the education of our young people. Down District Council Chairman Councillor Mickey Coogan launches the Chairman’s Awards at the Down Civic Forum with Nicholas McCrickard, Manager of the County Down Rural Community Network. Down District Council Chairperson Councillor Mickey Coogan launched the Awards competition today (1 March). 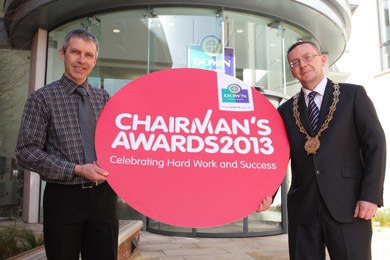 He said: “It is a great pleasure to be launching the 2013 Chairman’s Annual Awards. These Awards give us all an opportunity to recognise, share and celebrate the fantastic work that is going on in our schools and across our primary education sector. I hope schools, parents, pupils and teachers will be inspired to think about all of the great things that they are doing that could be shared with others through these Awards. “Endeavour and innovation is notable in many of our school communities across Down district. This is demonstrated by the high level of creative projects that are undertaken as part of the school curriculum by teachers and pupils throughout our area. Findings of Down District Council’s recent socio-economic profile report stated that Down district has a more highly educated workforce and a lower share of adults without qualifications. The Awards competition is now open for nominations and is open to all Primary Schools in the Down District Council area. The Awards are split into five categories: Active Award; Cultural Awareness Award; Enterprise and Employability Across Learning; Learning Through Technology; and Sustainable Schools. Do you know a local Primary school that shines within Down district? If so, this is the opportunity to ensure that deserving schools and education stars are recognised. Nominations for Down District Council’s Chairman’s Awards 2013 ‘Celebrating Hard Work and Success’ must be received by 12 noon on Wednesday 17 April 2013. Nomination forms may be downloaded from the Council’s website www.downdc.gov.uk or by telephoning 028 4461 0854. The Down District Council’s Chairman’s Annual Awards 2013 will be presented at a Prize Giving Reception in the Downshire Civic Centre.